Coming from New Zealand, I’m used to being independent. Driving to work each day, meeting friends for coffee, going to the movies. It’s a good life. But for women in Saudi, the very opposite is true. Life is one long list of ‘must nots’. In fact, they cannot even get in a car or plane without the personal or written permission of a male relative. No room for any spontaneous flights of fancy. Not anywhere. Only men work in Saudi. Well, more accurately, Saudi women only work on very rare occasions. And then, they must be physically separated from the potentially dire risk of contact with men, even to the point of having completely separate elevators. But girls can be educated as far as university. In fact, it’s encouraged. 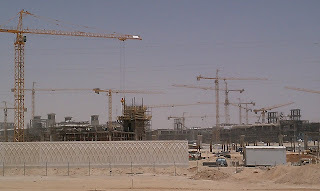 In 2008, King Abdullah initiated the construction of a state-of-the-art women-only university. Spread over 8 million m², the Princess Noura Bint AbdulRahman University will have the capacity to enroll 40,000 girls, at the cheap cheap price tag of around $5 billion US. Driving in from the airport when I arrived, I passed the university construction site. 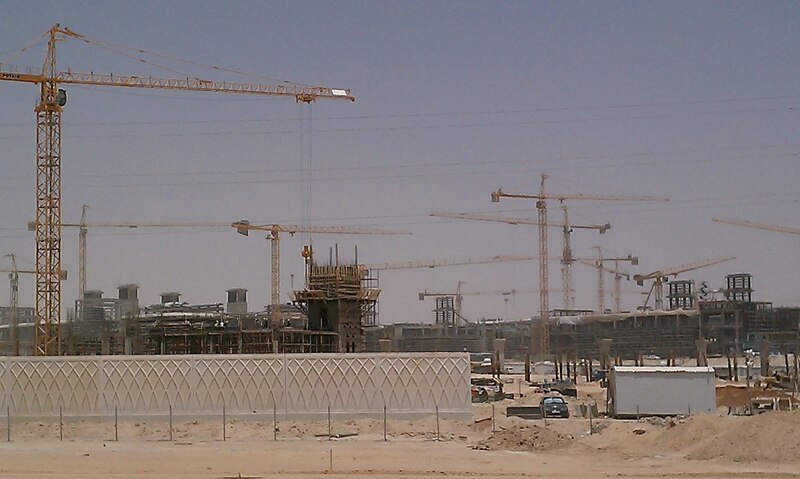 The dusty landscape of cranes and scaffolds seemed to stretch forever. Perhaps this is part of a ground swell for change? Certainly the king’s been a powerful advocate for women’s education, and for their integration into the work force – despite opposition from Islamic clerics. But in the here and now, marriage and babies take the place of work. So men end up doing things they’d never do anywhere else in the world. In the malls, men are behind every counter. They sell perfume, make up and most oddly of all, lingerie. I wonder how Saudi women, who are so intensely private, feel about having to make such personal purchases from a male shop assistant. The other obvious restriction is dress. Saudi Arabia’s strict interpretation of Islamic Law encourages women to cover themselves from head to toe in public. They also wear either a hijab (headscarf) or niqab. The niqab completely covers the face, leaving only the eyes. Right now, black is my least favourite colour. And then there’s something that I experienced just a couple of weeks ago. My husband and I visited our local bank so I could get a bank card. (I was tired of existing on cash.) Like much of Saudi, banking is segregated. Men enter through the front, the ‘Ladies Section’ is around the back. We were ushered into a very pleasant office. Lush, deep pile carpet, an elegant wood graindesk devoid of clutter, and a very Saudi green and gold colour scheme. A traditionally clad Saudi (white thobe and red head scarf) courteously shook my hand as well as my husband’s. This was encouraging. He made every effort to direct the discussion to me and call me by name but amusingly, every so often he would forget, and speak to my husband about me inthe third person. There were many forms to sign – mostly by my husband, of course. And then, finally, I left happily clutching my bank card. One small step in my road to independence - or so I thought. There’s a strange system in place here regarding bank card purchases. Whenever my husband buys something, he immediately receives an automated text on his phone confirming the amount of the purchase. Apparently this is a security measure. Last week I was shopping with a friend at Faisaliah Mall and bought a top from Zara. Almost to the minute of my bank card payment, my husband received a text confirming the amount. So…my road to independence in Saudi? Three steps forward and two back. It's not the only country where the primary cardholder gets a txt on purchases....One keeps her Australian visa for a reason!!! I quite enjoy checking up on whats being purchased while I'm not around... although, it can spoil surprises sometimes!